Chess Informant 106 contains 297 annotated games and 484 variations. 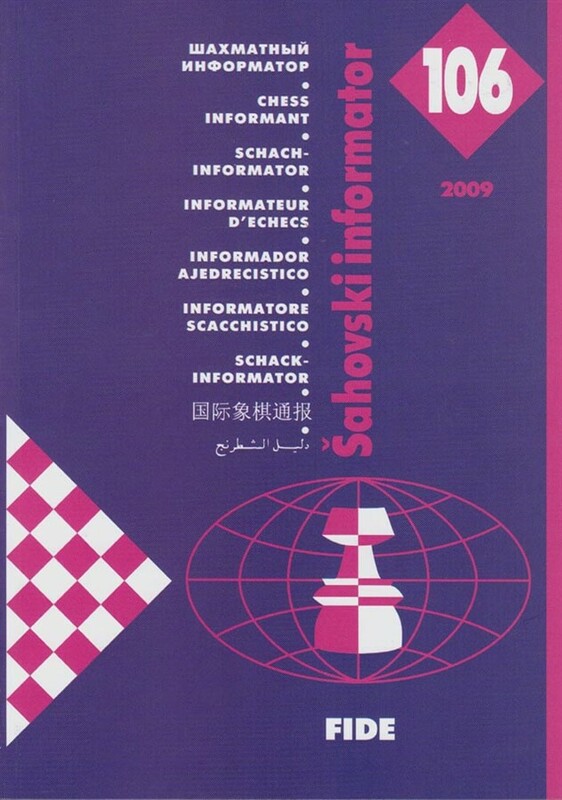 Covers events held between May 1, 2009 and August 31, 2009, including Sarajevo, Sofia, Leko - Anand (m), Poikovsky, La Habana, Bazna, Dortmund, San Sebastian, Biel, Jermuk, Russia - China (m), Amsterdam, etc. Contributors include V. Anand, Kramnik, Leko, Dominguez Perez, Motylev, Rublevsky, Bu Xiangzhi, Vitiugov, Kasimdzhanov, Sasikiran, A. Beliavsky, Roiz, Ivan Sokolov, Predojevic, Amonatov, Krasenkow, Bruzon Batista, M. Gurevich, S. Atalik, L. Christiansen, J. Benjamin, Ar. Jussupow, Jan Timman, Ch. Lutz, Ribli, Mikhalchishin, Speelman, and many others. Trademark sections: The voting for the ten best games and the ten most important theoretical novelties from Chess Informant 105, theoretical survey in ECO format, the most interesting recent combinations, endings and studies, tournament standings and crosstables, and the best of Rustam Kasimdzhanov's creative output. Column "Modern Chess Theory" completely covers three most popular openings C 42, E 04 and E 97.